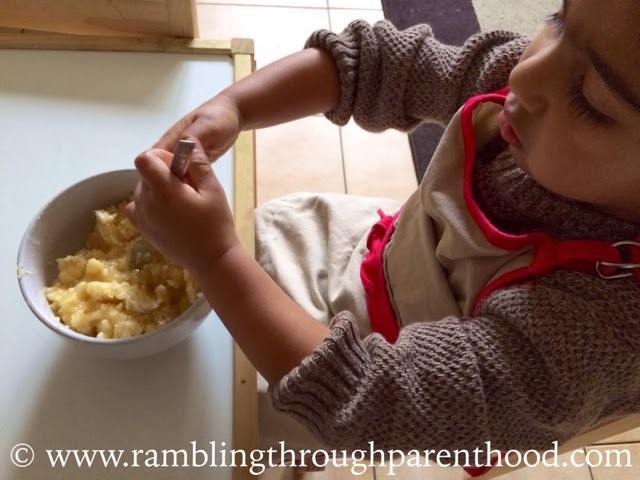 An inquisitive toddler, ever so willing to help. A few very, very ripe bananas, nearly ready for the bin. And school holidays. The perfect pre-requisites to bake the perfect cake. As I had all these very vital ingredients on hand this week, I set about baking a cake. 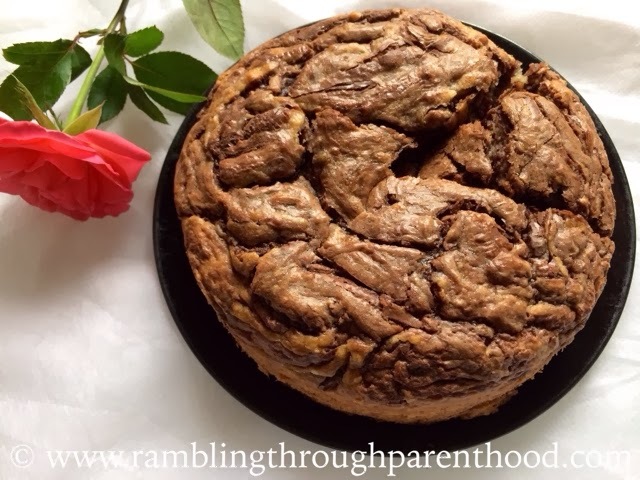 A banana cake. With the added hazelnutty chocolatey deliciousness of a layer of Nutella. Well, to be honest, I intended it to be a Nutella drizzle cake. But turns out Nutella has a mind of its own. It decided to sit on top as a layer. So we ended up with a Nutella layered banana cake instead. All good. I recruited the assistance of my little helper to make my our cake. 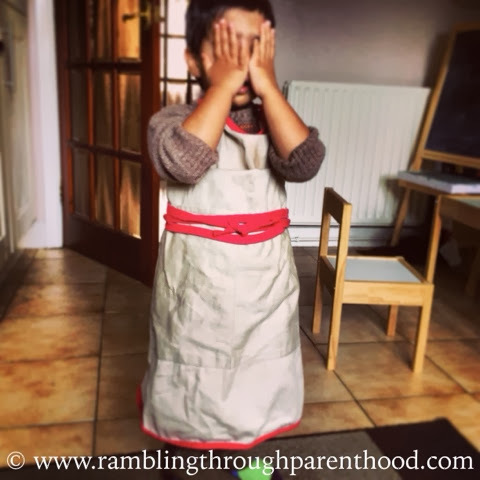 He got kitted out in my kitchen apron, and was very, very pleased with himself. Although the photo may say otherwise. Then we got to work. J sat down at his kitchen table to mash the bananas. And mash them he did. With great gusto. And a lot of determination. All the while singing very relevant rhymes. "Stir the pudding, stir the pudding, mix, mix, chop..." and so on. The nitpickers can point out that it was not technically a christmas pudding he was helping with. And he was mashing bananas, not stirring a pudding. But hey, what do they know about toddlers? And certainly nothing about mine. So there. While J kept himself busy with the bananas, I readied all the other ingredients. I measured out the flour, butter and sugar and put them all together. I then set about rubbing the marg into the flour till the whole mixture became the consistency of breadcrumbs. Then I tipped in the eggs and the mashed bananas and mixed everything up with a spatula. The mixture got poured into an 8-inch greased and lined baking tin. I warmed the Nutella for a few seconds in the microwave (about 20 seconds for 4 tbsp) to make it easier to spread around. Next, I poured the slightly runny Nutella on top of my cake mix and swirled it around with a skewer. The cake went into the centre of a pre-heated oven to bake at 180 degrees, and came out all ready after 55 minutes. I did check with a skewer to make sure it was baked all the way through. We allowed it to cool for what seemed like an eternity before slicing it up and devouring it. 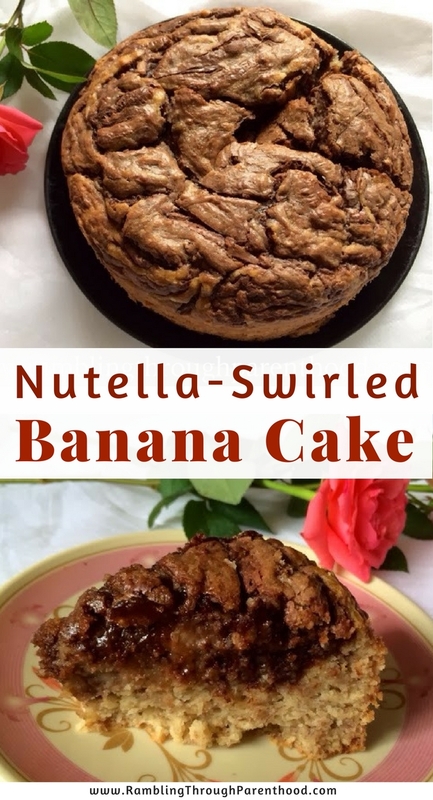 Oh that does sound good- I love making banana loaf, and nothing was ever made worse by adding Nutella! Ooh I love how the Nutella has merged with the cake, I may try this with a jar of chocolate spread. That looks and sounds lovely... you might have a budding chief on your hands!! Nutella + banana + cake = 3 of my favourite things! What a great idea! 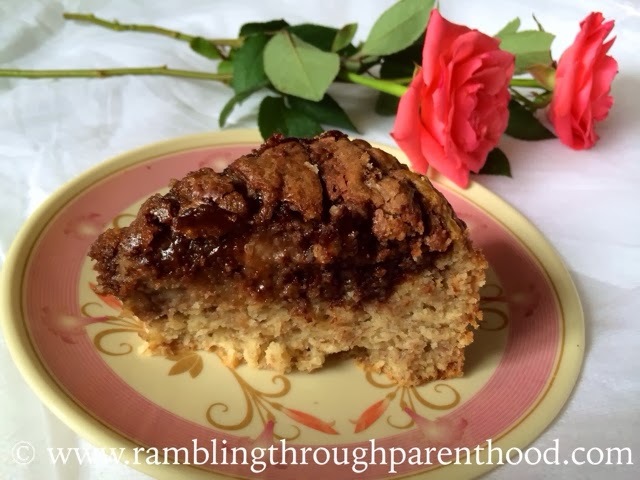 We love banana cake and nutella but never tried them together! 85 min baking time? Wow, that's a long time... but it looks like it is worth it. Oh wow, that looks and sounds incredible. Oh my that sounds very naughty but very nice too. Was it as lovely as it looks? Yummy! Sounds like a great combination of ingredients and then end result looks very delicious! Drooool! I was going to make chocolate banana loaf next week but my recipe doesn't have Nutella. It must have Nutella! Might be trying your recipe instead. I know Potato would love making and eating its!